It’s no secret that we here at the Oral History Review are big fans of the OHA Annual Meeting. It’s our annual dose of sanity, a thoroughly enriching experience, a place to make connections, a great opportunity for young scholars, and the origin of some lively online debates. With nearly two months still to go before #OHA2017, we want to share a couple of reviews recently published in the OHR that we hope can help carry us all through until we are reunited in Minneapolis this October. First, our very own Troy Reeves wrote an essay in which he reviewed two books about Joe Gould, including one by this year’s OHA Keynote Speaker, Jill Lepore. In it, Reeves traces his process of discovery and disillusionment with Joe Gould and his mythical book, An Oral History of Our Time. He asks how one can love an idea, and the possibilities it opens up, while acknowledging the complicated and problematic history of the man behind the idea. 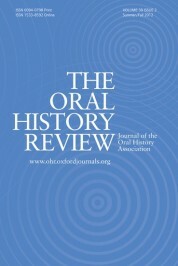 Reeves’ review is a continuation of a line of thought Daniel Kerr raised in his 2016 article, “Allan Nevins Is Not My Grandfather: The Roots of Radical Oral History Practice in the United States.” Kerr’s piece asked what oral history family trees exist aside from the canonical version that imagines Allan Nevins as the progenitor of our discipline. This article has been a jumping off point for multiple recent posts on the OHR blog, including Allison Corbett’s oral history origin story, and Benji de la Piedra’s suggestion that the architects of the WPA’s Federal Writers’ Project can provide a scholarly ancestry that prioritized shared authority and meaningful encounters between researchers and the public. We will bring you an insider’s take on Minneapolis in a few weeks, but for now we’ll point you to a piece that touches on a bit of local history. Barbara W. Sommer reviewed Non-Stop: A Turbulent History of Northwest Airlines by Jack El-Hai, asking what role oral history played in creating the book. El-Hai traces the rise and fall of the airline, which was headquartered near Minneapolis, and provides a visually interesting introduction to the company and the region. Both of these reviews are now up on Advance Access for OHR subscribers, as are the rest of the articles that will appear in the print issue. Check them out now, and make sure to keep an eye on the blog in the coming weeks for interviews with OHR 44.2 authors, a sneak peak of #OHA2017, and more! What do you love about the OHA Annual Meeting? Let us know in the comments below or on Twitter, Facebook, Tumblr, or Google+. Featured image credit: “Downtown Minneapolis” by m01229, CC BY 2.0 via Flickr. Andrew Shaffer is the Social Media Coordinator/Editorial Assistant at The Oral History Review and a Ph.D. candidate in History at the University of Wisconsin – Madison.